You must make reservations at least 5 minutes in advance of the time at La Piazza. Complimentary Valet Parking on Friday & Saturday nights. Weeknights park in adjacent parking spots. Dazzle your guests with the best Italian food around. No detail left unattended. 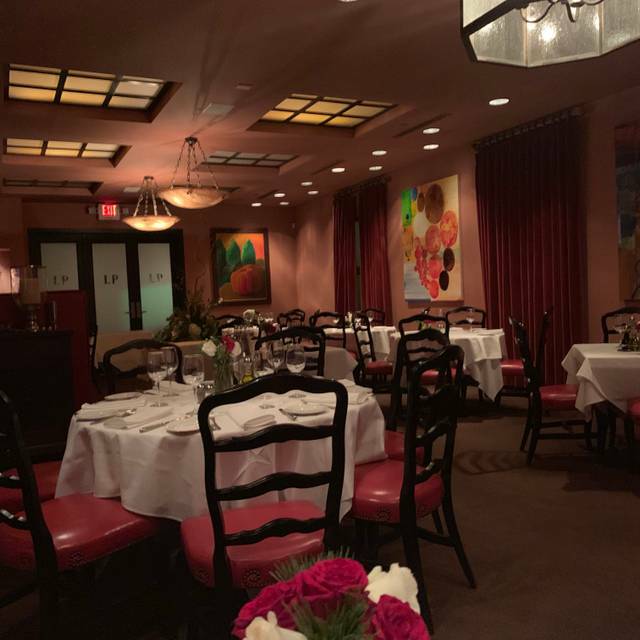 Whether celebrating a special occasion with family and friends or hosting a corporate event, La Piazza can accommodate all your special event needs. DRESS CODE! Upscale Italian Dining for the past 25 years in the cultural district. Owner, Vito Ciraci has brought family recipes from his hometown. Perfect and established spot for nightly dining or for that special occasion. JEANS PERMITTED IN BAR AREA ONLY, NO TENNIS SHOES, NO SHORTS ALLOWED! The only traditional Italian restaurant in town that offers the very best dinners and outstanding service. Always great food, service and a quiet environment. Authentic Old world Italian food and dining. The service and ambiance was wpectacular and a welcome respite after a busy day! I would definitely recommend La Piazza! Overpriced for how the food tasted. Wouldn’t recommend. Always a memorable experience. We have been dining at La Piazza for many years and the experience never disappoints. The atmosphere, staff, and food are second to none. This is a true gem in Fort Worth. Try the family wine. You'll be glad you did. The owner, Vito, was there and took time to come by and welcome us for our Valentine's Day dinner. He was very kind. Our waitress (forgot her name) was very attentive, gave us great suggestions, and was very professional and sweet. The food was delicious! My fiance got the Veal Chop which was unlike anything I've tasted before--it was wonderful! Our parents have been going to La Piazza since before we were born, and we hope to continue the tradition! Another awesome experience. Food, service and atmosphere were great. We looked on- line to see the menu ahead of time and once we go there the menu was very much abbreviated from what was on-line. The rolls were what you can buy in a store that are served at inexpensive restaurants. My husband ordered the special of spaghetti and meatballs (for $30) and it wasn't any better than what we used to eat in high school. I had salmon that was very basic. It was expensive for the value and quality. They advertise this as an exquisite high end Italian restaurant with a strict dress code but it did not feel like that - Olive Garden is as good! It was a birthday dinner and I was very disappointed. It was a Friday night and there were only a few other people in the restaurant. I would never go back or recommend it to anyone. As always, great food and great service. Perfect ambiance for date night. The food there is mediocre. Lasagna was inedible ( sent it back). Linguine with garlic & oil was flat. Escargot were not outstanding. Wine was fine, tho. With such a stringent dress code they should have great food. They don’t though. The dinner was exquisite and the host, Vito and his daughter Tina, were extremely accommodating and great hosts. Wonderful evening. Highly recommend the restaurant for special occasions and outstanding food. The recent traffic disruption in this area is annoying , it is very worth the time and effort to get to this wonderful eatery. We were running late due to weather on our way to a nearby stage production. The staff went out of their way to assure that we were well taken care of in short order so we would not be late to the play. The service was quick and friendly. The food was outstanding and we can't wait to go back when we can really enjoy it more and not have to rush. Thank you La Piazza team for a great meal. La Piazza never fails! From the moment you are welcomed in to the parting words, you are treated to an exemplary authentic culinary dining experience with exceptional service. Highly recommend! Vito and his family never fail to amaze. Couldn’t recommend more highly. The experience keeps getting better! Food is amazing! Great wine selection! Outstanding service! The location is convenient to downtown Ft. Worth. The valet parking was very nice and safe for my car. The atmosphere was quiet and relaxing. The service staff was very friendly and helpful with seating for my party. Our drink order was quick and right. Our dinner selection was a little limited but offered a meat, a fish, and a poultry dish, along with Pasta. The meal was prompt and nicely prepared. Everyone's meal was to their liking, it was hot and fresh. The service personnel kept us supplied with water and tea. The deserts were good and their presentation was very nice. Overall, we had a very nice time and will definitely return. Excellent Dining Experience! Family owned and operated business, absolutely true Italian from the food to the wine, the music and the subtle background sounds of the spoken language. One of the best finds we've had in a long time! Also so great to find a fine restaurant that enforces a dress code. Thank you! The atmosphere is amazing matched by the caring staff and outstanding food! A perfect evening with my wife! Excellent service, great food and good wines, too. A perfect place for a special meal. Our favorite place for great food and excellent service! It was a bit pricey, but the food and service were first-class. Also has a superb wine list. This place is a Fort Worth legend. This is the finest place in Fort Worth. Want to impress an out of town guest or a date? Take them here. You won’t be disappointed. Great experience! Exceptional food! Charming service! The best dining experience ever!! Fabulous cuisine and fabulous service!! Everything was was superb! Great food, attentive service (Mr. G is awesome), terrific wine list, cozy, romantic atmosphere. Very elegant. Men, minimally wear a jacket, if not coat & tie. At the conclusion of the night, when Vito (Owner) and his daughter break out into an Italian Aria, it's as if one is transported to La Scala. These are world class talents on display. Fabulous restaurant with authentic Italian food and owners. This is an incredible, local gem where you will feel like you are family.